With just two more weekends of competition before the conference championship and three scoring opportunities for teams to maximize their NQS, it’s getting to be crunch time for those bubble teams and individuals. Why You Should Cancel Plans For It: Minnesota is on fire. Its season high scored last week is 0.025 higher than Georgia’s best total of the year. Look for both teams to aim for perfection here. Minnesota is looking for one more big number to drop a 195.600 from its NQS and pass Alabama at No. 9. Likewise, Georgia is looking for one more big away number since most of its big scores have come at home. Arkansas is on a quest to eliminate as many 195s as possible from its NQS, so will aim for a low- to mid-196 here. For Michigan State, a big score here is an opportunity to come closer to securing a regionals spot; it needs at least a solid 195 to keep that hope alive. What Else You Should Know Before Tuning In: Michigan State and Minnesota both have already competed on podium this season, at the Toledo Elevate meets. Georgia and Arkansas have not, though they may not be at a disadvantage since their younger stars are experienced. 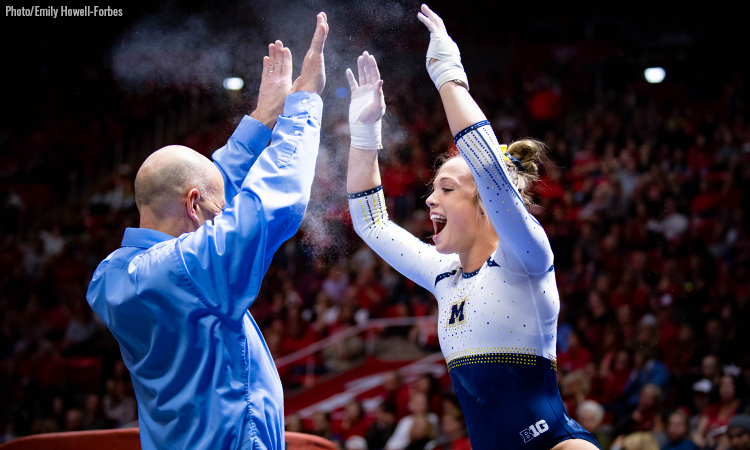 Rachael Lukacs, for example, competed on podium at the Nastia Liukin Cup five years running. Why You Should Cancel Plans For It: Last time No. 1 Oklahoma came to Ann Arbor, the meet came down to the last routine. Chayse Capps needed a 10.0 on beam for the Sooners to take the meet, and she notched that mark exactly. We’re expecting just as many fireworks this time around. What Else You Should Know Before Tuning In: This is Michigan’s senior night, so expect emotions to run high while the Wolverines bid farewell to Olivia Karas and Emma McLean. Keep an eye on Michigan upgrades too; will Natalie Wojcik throw her full-in for the final home meet? Why You Should Cancel Plans For It: It’s rare that two teams compete against one another two weeks in a row, but Auburn and Alabama do exactly that this week. Auburn will likely be back with a vengeance after some misses kept it from full potential last week; though it no longer has a chance at the SEC regular season title, it still has time to make a statement going into postseason. What Else You Should Know Before Tuning In: Auburn takes another crack at earning just its 11th W all-time against Alabama. The two teams met last week in Tuscaloosa for the Crimson Tide’s senior night. Why You Should See the Error of Your Ways: All of these teams are peaking at exactly the right time. Though the top three ranked teams look like locks to qualify for nationals based on their SAS, the other three have done really well recently with Ursinus scoring a season high last weekend and Rhode Island breaking its school record. Watch as all six of these teams push to finish up the season at the top of their game. Plus, anything can happen as the top three teams at this meet qualify to NCGA nationals. Why You Should See the Error of Your Ways: The WIAC isn’t quite as cut and dry as the NCGA-East is in terms of which three teams will qualify to nationals. The top four teams here all have an SAS within a point of each other, and the others all have season high scores that could put them in the mix as well. You really can’t count any of these teams out, so it’s going to be an incredibly exciting fight to the finish. Why You Should See the Error of Your Ways: At the beginning of the season, did you think UIC would be the highest-ranked team in Illinois by the annual Illinois Classic? If you did, kudos, you have better foresight than us. Illinois is completely capable of repeating as Land of Lincoln champions, but it will take a complete hit which has been a struggle for the Illini this year. Don’t count Northern Illinois out either; its 195.700 peak is higher than both UIC’s and Illinois’ as both have topped out at a 195.650. Illinois State is a touch behind the field, but with misses from the other three, the Redbirds aren’t out of the game either. Also, can we all please have a moment for the No. 33, No. 44 and No. 55 teams all together. *SO SORRY for using FloPro videos; there is not a single Anna Martucci or Cinny Lamberti video anywhere on Twitter or YouTube from her college days. It is the mission of the gymternet to rectify this before her career ends in a few weeks. Why You Should Clear Space on Your DVR: Boise State. BYU. The top two teams in the MRGC, meeting up for an epic conference matchup! These two teams both registered season highs when they met at BYU; will we see the same in this meet? As the end of season approaches, keep an eye on how these teams match up ahead of the conference championship. Why You Should Clear Space on Your DVR: This may look lopsided, but Penn State’s reemergence into the top 25 comes on the heels of some solid away totals. It is a team capable of a big score with a hit, and the Nittany Lions will be hoping to take advantage of scores in the O’Dome to add to their NQS total. Why You Should Clear Space on Your DVR: It’s senior night at LSU, but it isn’t goodbye just yet for the senior Tigers—they’ll return to the PMAC for regionals. We’re still expecting high scores after judges in Baton Rouge remembered how home scoring works last weekend and awarded seniors Lexie Priessman and Sarah Finnegan the first perfect 10 of the SEC season. Oregon State had problems on beam last weekend and will be hoping to recover this week to pick up a useful away total in the friendly scoringing environment at LSU. It’s still counting one score below 196.000 in its NQS, and its primary goal will be to change that. But if things go right on bars and beam it’s capable of a 197. Why You Should Clear Space on Your DVR: UCLA is closing its regular season with two extremely winnable home meets, and this one versus Stanford is already sold out. Lineups are still in flux for the Bruins: We’re watching for Nia Dennis or a Glenn twin to be healthy enough to replace one of their lower-scoring bars routines while Dennis and Pauline Tratz seem to be fighting over one spot on floor and Gracie Kramer and Margzetta Frazier have recently been spotted training Yurchenko double fulls on vault. This is Stanford’s final regular season meet, and it has a chance to drop a low 195 from NQS. The returns of Lauren Navarro to beam and Catherine Rogers to bars add some much-needed depth for the Cardinal. We’re anticipating that Taylor Lawson will be back from illness too.